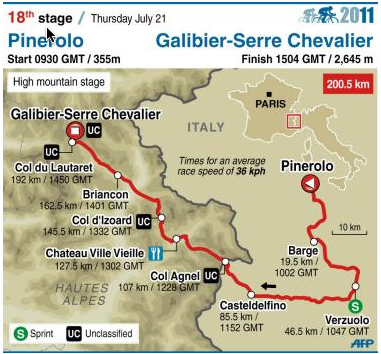 Live link online to watch Stage 18 (in the morning) Tour de France on Eurosport (x out both ads, no need to download). More live links at: http://www.steephill.tv/tour-de-france/#live. Watching the time gaps Gaps on LeTour website and live report CyclingNews live reports. 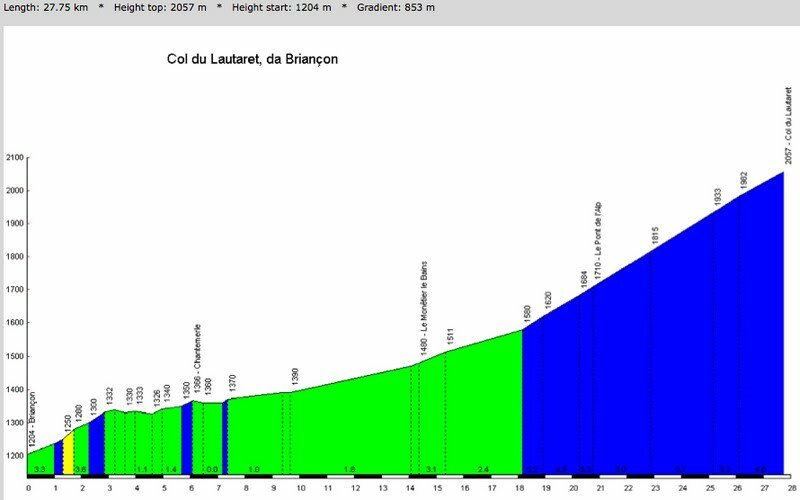 4 big profiles of today's climbs - the Col Agnel and the Col du Lautaret are both very long. 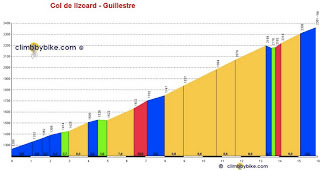 Also the Col d'Izoard and the Col du Galibier add intensity. Route of Stage 18 - This video makes it look like they are covering more than 2 countries! That is how I would describe the climbs of Col Agnel and Col d'Izoard (d-Iz-wah). These climbs are out there. Out in the middle of nowhere, between ski resorts and long empty roads through glorious fields of wild flowers. 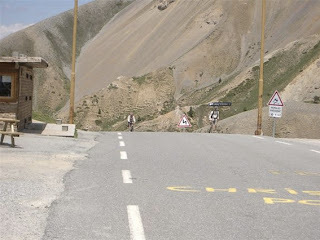 When we climbed the Col d'Izoard in 2007, the only real people we saw out on the climb were a few cyclists, and a military troop training in the area. At least we didn't have to worry about cars! This was also the day I counted over 30 flys on the back of my brother's jersey (I know I am back on the fly theme again, which reminds me did you see the fly on the TV camera lens during Stage 17 yesterday? I don't make this fly stuff up). 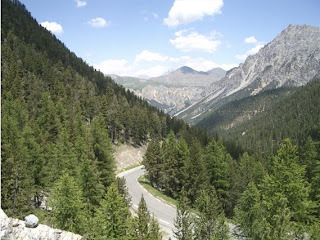 The Col d'Izoard was a climb I had heard of in the Tour de France (yes one of those on the bucket list). And so we went. 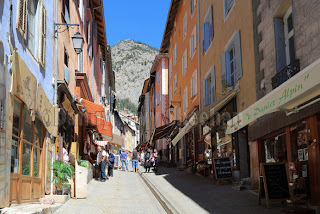 I enjoyed the town of Briancon very much, my sister-in-law found a great bookstore and ice cream shop as we climbed into no man's land. Beyond Briancon the road is fairly large with high traffic (and tunnels) all the way to the Col du Lautaret. Where we saw a large group of Botanists studying wildflowers in the fields. 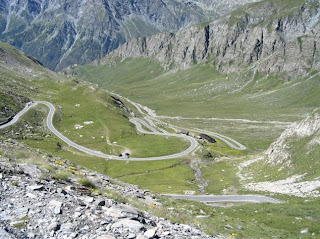 The Col du Lautaret is more like a bump on the road. If you continue driving north you will come upon the nice town of Bourg d'Oisans, turn right and voilà you have found the switchbacks of Alpe d'Huez. 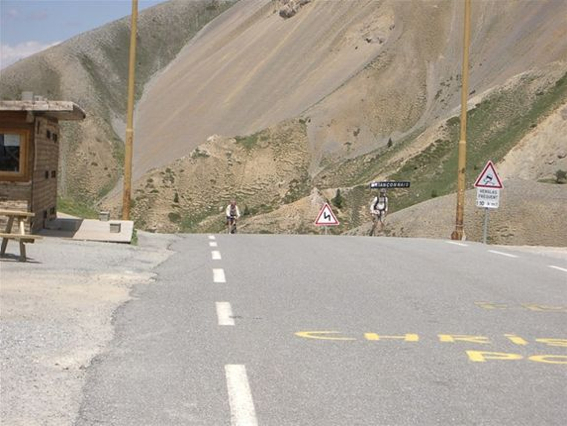 Turn right at the Col du Lautaret and you have no choice but to go up and over the Galibier. 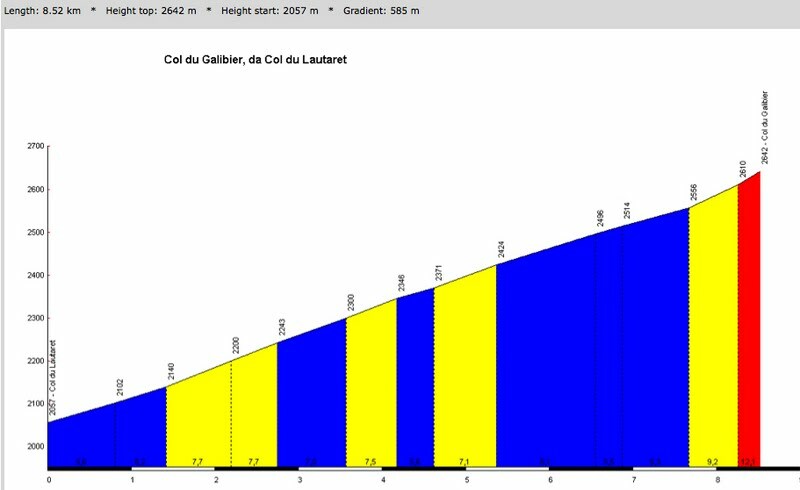 No matter what everyone says of Alp d'Huez, as an amateur cyclist, the Col du Galibier is so much more, especially the other (east) side. It is a big big climb. If the weather moves in on the Galibier it can be serious. Once you are on the climb you are committed. Alp d'Huez on the other hand is a series of (21 to be exact) rather fun switchbacks offering a changing view of the valley below with a number of homes, businesses, cafes, and a church along the climb. 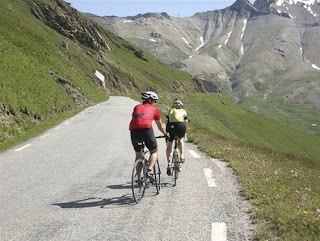 There is only one side of Alpe d'Huez - up. Alpe d'Huez is fun on a non-Tour day, and a blast on a Tour day. Galibier is one big bad mighty climb. 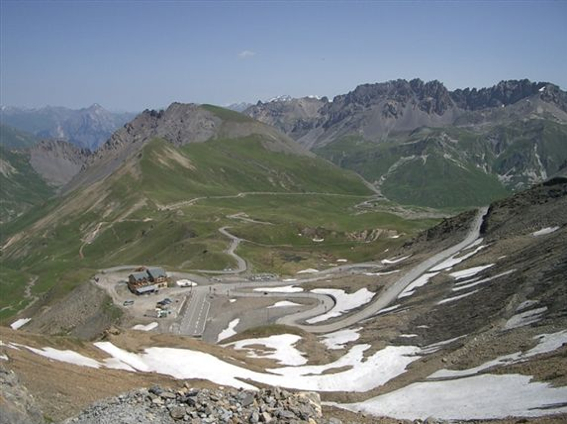 The 2011 Tour de France will tackle the Co du Galibier twice this year, from both sides. On the west side is the Col du Lautaret, on the east side is the Col du Telegraphe (another oft climbed Col in the Tour de France, and a good one to climb if you are in the area). What and where is Galibier Serre-Chevalier? 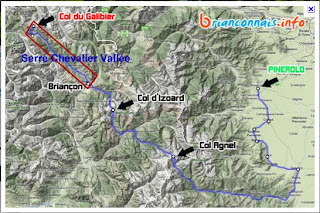 The valley of Serre-Chevalier, extends from the summit of the climb of the Col du Galibier south to the town of Briançon. Chevalier in French means knight or horseman, yet Serre-Chevalier can be translated to mean flock of hills. This valley was once under Roman rule and is now an active ski area. There is no town at the base, or on the top, of the Galibier, (although there is a hotel cafe on the Col du Lautaret). 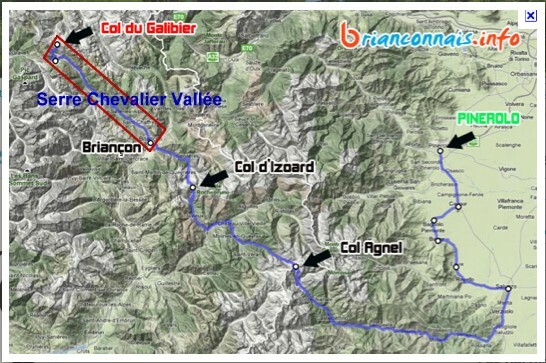 Therefore they are giving the large ski-town of Serre-Chevalier down the road the credit for the finish of Stage 18. The race goes through this town, but finishes up the Col du Galibier.